What We Do at Collins Orthopaedic? Dr. Geoff Collins has been providing specialty orthopaedic care in the Lake Charles and Sulphur communities for more than thirteen years. 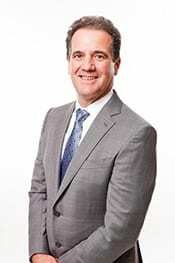 As the founder of Collins Orthopaedics and Sports Medicine he is Board Certified and treats orthopaedic problems of the shoulder, knee, and hip. He is also fellowship trained in sports medicine after spending a year at The University of Miami. His fellowship was associated with several professional athletic programs in south Florida. He is passionate about getting athletes back to play. Dr. Collins operated on my knee in October of 2015. Dr. Collins was very thorough about my procedure and answered all my questions before I even asked them. He made me feel comfortable and very prepared for what to expect after my surgery. He and his staff were extremely professional, friendly and helpful throughout my entire recovery. 6 star rating on the 5 star scale for Dr Collins and his team!! He and his team performed a total shoulder replacement on me in December 2013. February of 2015 we replaced my right knee and then replaced the left knee in December of 2015. If you have to have these type of procedures Dr Collins and his team are the best! I have recommended them to friends who also had excellent results. Great team and great people!! I live in Lafayette and was referred to Dr. Collins. I was anxious to travel from Lafayette to Lake Charles, but after speaking with several Lafayette physicians, I decided to make an appointment with Dr. Collins. At my first appointment I met Mark Hebert, Dr. Collins’ PA, and Devin, Dr. Collins’ nurse, and was very impressed. Then I met Dr. Collins and after only two minutes I knew he was the man to do my surgery on my arm. He performed the surgery on December 31, 2015 and I have had practically no pain since then. At my two week post-op Dr. Collins said everything looked great and sent me to physical therapy. The Physical Therapist was very impressed by how well my arm was healing. I was the head coach at the Ragin’ Cajun Boxing Club in Lafayette and was not able to do much work with the kids. In boxing a left jab is one of the most, if not the most, important punches in boxing. The jab set everything up for the right and left hook. I am almost certain that when Dr. Collins releases me I will be even better than before! Thank you, Dr. Collins!